Oh Mia...I love love love lemon and basil together. White chocolate is my favorite! I will make those if I have time tonight for my Euchre (card) club. I have 12 ladies coming over and I know they would love these! Wow these look so very good. I love lemon and basil too!! I am pinning this recipe. What a wonderful combination of flavours, Mia! Lemon and basil- perfect, mmhh! And the cookies look so tender... Beautiful photo! Sadly my fresh basil is no longer with us. However, that does not mean I cannot buy a few sprigs for this tasty recipe. The three flavors together sound heavenly. Great post. These look so lovely. 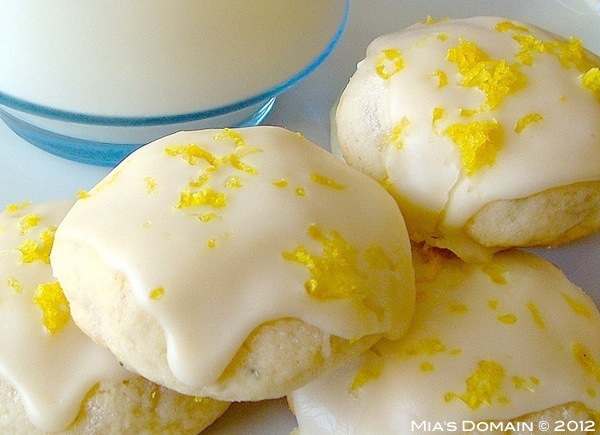 I love lemon and basil and always enjoy an iced cookie! Thanks for the recipe. Mia, these cookies are wonderful! Made these for a girly tea we had today. I have a question though. On the icing, should it be 3 tablespoons lemon juice with 3 tablespoons powdered sugar? I did this and was very watery, I lost count how much sugar I had to add to the lemon juice but it was over 2 cups before it started to thicken. I will definitely make these again, they are on my "keeper" list! Thank you, Joan! Not sure what happened but it's actually 1/2 cup powdered sugar, 1 tablespoon lemon juice, 2 tablespoons lemon zest. Hello Mia, What a beautiful blog you have created!! So many great looking recipes and fabulous photos. I blogged about them today, and linked back to your site. Your blog is among one of my new favorites. Have a great day! ~m. Oh Mari that's wonderful news!! Thank you! !